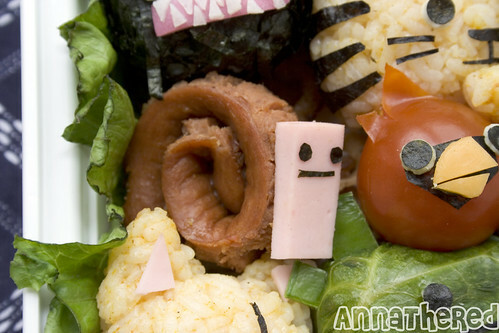 Posted by AnnaTheRed in bento blog (all), bento blog - video game. 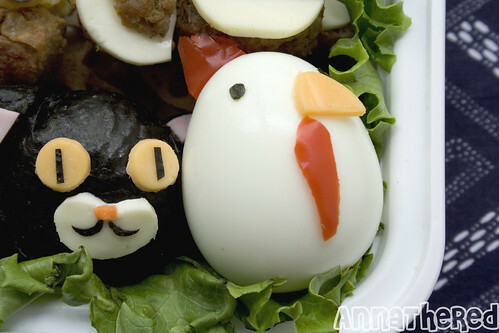 Bento #44: Animal orbs bento! Animal Orbs are tiny animals that float around you and help you in the game by picking up items, attacking enemies, or gaining exp faster, etc… If you aren’t familiar with the game, Castle Crashers, all you have to know is that they are just painfully adorable. I’m not just saying this because the people at the Behemoth seem very cool, but those googly eyes and huge head are the key features of cuteness. 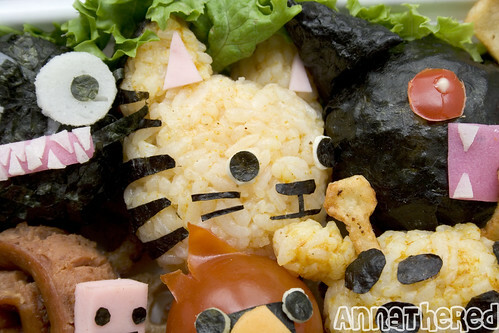 I just had to make them out of food so my boyfriend could eat them. First, I found images of all the animal orbs, I put a piece of paper on my laptop monitor, and traced each of them. 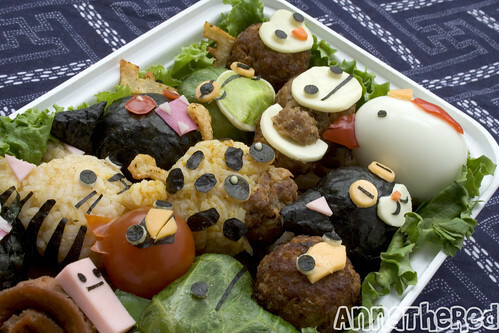 Then I cut them out, and wrote down ones that I could make with rice, ones with meat, ones with lettuce. I know I should’ve picked which one to make first THEN traced them… But having all paper cutouts of Animal Orbs is pretty fun actually. 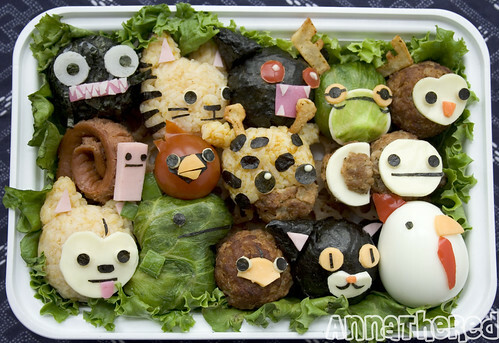 There are total of 14 Animal Orbs in this bento, and I worked on all of them simultaneously, so writing exactly how I made this bento might be a little confusing, so I’m going to explain how each animal was made, each row, starting from the top left. I mixed rice with curry powder and ketchup, and made a small rice ball. I also made ears with the same rice using a plastic sheet. For the stripes, nose, mouth and whiskers I cut out seaweed. 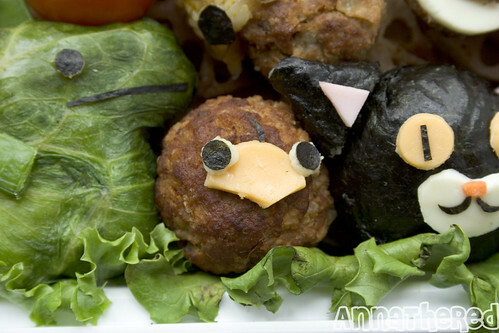 I made the eyes with seaweed on cheese and put them on the head. For the pink part of the ears I cut a small piece of fake sausage (fish cake). I made a small ball with potato salad, and wrapped it with a microwaved lettuce leaf. 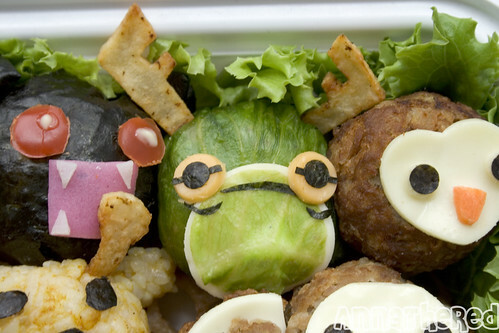 Then I cut a circle out of the lighter green part of lettuce, put it on cheese, and cut cheese around it for Frogglet’s stomach. For his eyes I cut out cheese using a straw, and cut seaweed for the eyes and mouth. Then I sliced potato and cut it into the shape of the horns, fried them, and stuck them on his head. I cut out cheese with a heart-shaped cutter and put it on a meat ball I had made. Then I cut a carrot for his beak, made eyes with seaweed on cheese and put them on the face. the toothpick. For his face and mouth I put seaweed. For something that I made on the spot, I think this one came out pretty good. 😀 The only thing was the color of his neck.(?) It’s actually light brown/orange. Maybe I should’ve used potato. I carefully cut the skin of a cherry tomato and peeled it for the feathers on his head. For his face I cut seaweed and put cheese for his beak. 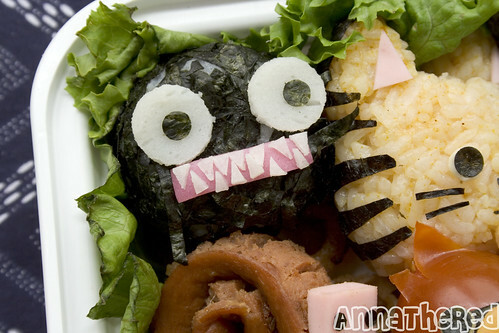 Then I made his eyes with seaweed on cheese. I mixed rice with curry powder and ketchup, and made a small rice ball. 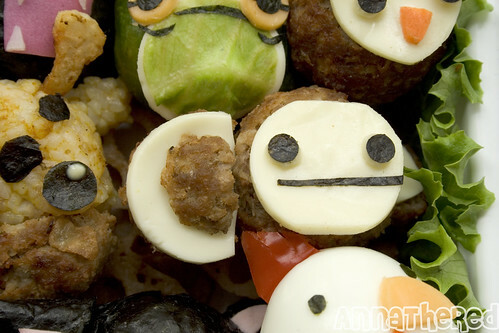 Then I cut a meatball in half, and put it under the rice ball to make his nose. 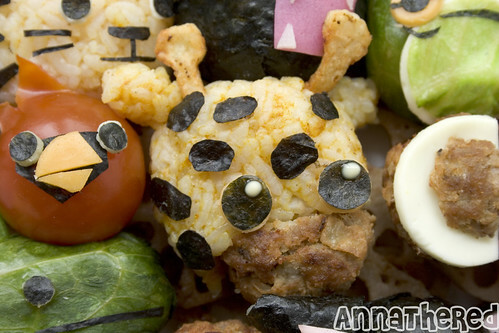 For his spots I cut seaweed, and made eyes with seaweed on cheese. Then I sliced potato and cut it into the shape of the horns, fried them, and stuck them on his head. I added the “sparkles” in his eyes by applying mayonnaise with a toothpick. I cut cheese using a plastic cap, trimmed it for his face, and put it on a meatball. Then I cut seaweed for his mouth, and made eyes with seaweed on cheese. For his ears I cut a meatball in half, placed it next to his head, and put cheese on top of them. Then I cut a piece of meatball for the darker inside part of the ears. I mixed rice with curry powder and ketchup, and made a small rice ball, and I also made ears with the same rice using a plastic sheet. Then for his face I cut out cheese with a big heart-shaped cutter. For his mouth and nose I cut seaweed for his, then made eyes with seaweed on cheese. I cut a small piece of fake sausage (fish cake) for the pink part of the ears, and cut the pink part of kamaboko for his tongue. 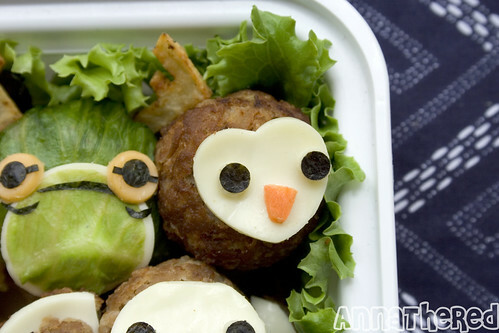 I cut cheese for his beak on a meatball, and made eyes with seaweed on cheese. 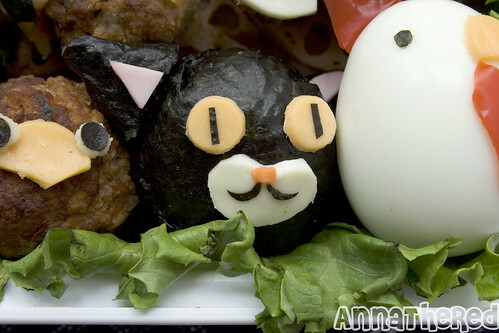 I made a small rice ball and wrapped it with seaweed, then made ears also with rice and seaweed. Then I cut out cheese and seaweed for the eyes and mouth. 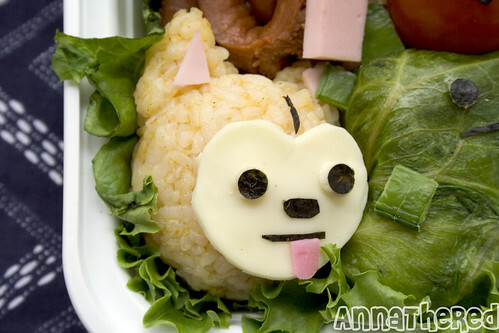 For his nose I cut a small piece of carrot, and cut fake sausage (fish cake) for the pink part of the ears. I cut red pepper skin for his crown, wattles (the red skin thing under beak, it’s called wattles! I googled it!) and tail. For his beak I cut cheese, and seaweed for his eyes. 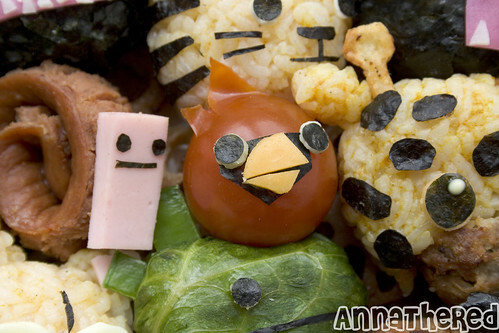 There are so much details for this bento, so please visit my flickr to see what food each character is made of! 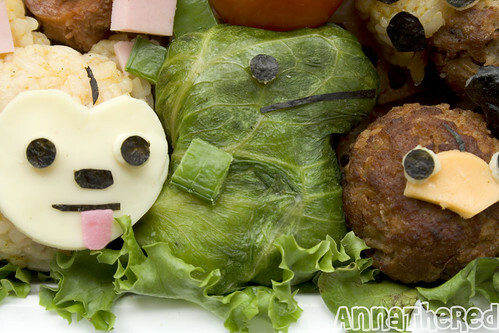 I’ve never played Castle Crashers but this is so cute!! Love the details in all of them. Kitties and birdies are too cute. Well done! 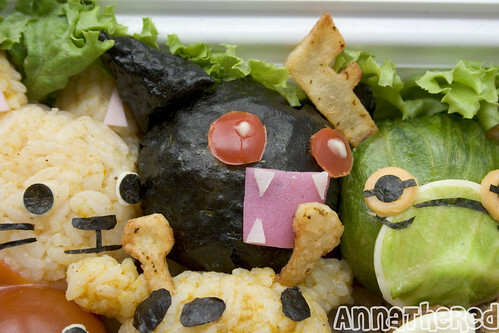 I haven’t played the game – but WOW this is a wonderful bento. You are totally talented! Ahhh they are super cute! You are right the big eyes add a lot of cuteness. These guys are my favorite part of Castle Crashers. Kawaii!